Come celebrate the whimsical Disney magic with all your favourite characters when Disney On Ice presents Passport to Adventure. Joining with Mickey Mouse, Minnie Mouse, Donald, Goofy and Daisy, you will be taken to the enchanted worlds of Disney’s The Lion King, The Little Mermaid, Peter Pan, and Disney’s Frozen. Disney On Ice presents Passport to Adventure tickets are currently available. The brainchild of Jamie Hewitt and Damon Albarn, cartoon band Gorillaz prepare to embark on their Humanz tour in support of their latest album. Taking a more mature tone, Humanz is expected to be one of the year’s biggest hits. 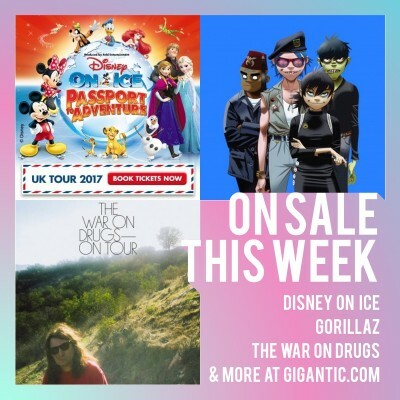 Gorillaz tickets are currently available. Having informed their fans of a brand new album titled ‘Thinking Of A Place’, The War On Drugs also announce two extra special concerts to showcase the new material at O2 Apollo Manchester and Alexandra Palace in London. The War On Drugs tickets are currently available. Massive weekender Lockdown Festival is absolutely essential for those of you who need to go big. And it doesn’t come any bigger than names like Wiley, Sigma, Dizzee Rascal Chase And Stauts plus the newly announced Fat Boy Slim! Birmingham lads The Twang announce a mighty tour at the end of the year. Starting at the end of November and right across December, you can see them play at a stage near you. Following a tour of the US, rock band Don Broco will return home to take over Alexandra Palace in London where they will blow their fans away. Both shows go on sale at 10:00 on Friday. Set a personal reminder right now to alert you with a text message or email when they become available. Offering every type of folk style from all around the world, Shrewsbury Folk Festival is a great fun for all the family. Afropunk returns to London after the huge success of their debut year, promoting diversity and defeating prejudice. Afropunk tickets are currently available. East London festival Field Day always brings together a great line-up of incredible cutting edge artists. Not only will Jack Up The 80s feature some of the biggest names from the decadent decade, but they have also brought S Club onboard. With the release of their brand new album ‘Heart Break’, Nashville country band Lady Antebellum have announced a handful of exciting headline dates at arenas in Manchester, Birmingham and London. Book yours before they go! The inventor of shock rock Alice Cooper returns to rock the UK. Fusing hard rock with outlandish stage antics, Alice Cooper has raised himself beyond the realm of mere mortals and is set to stun entire arena audiences in November.